Confused with high fares, bus timings, pick-up/drop points, specific operator services etc?Here is a simple and creative solution where you can choose your own options with "Smart Filters" designed for your convenient and flexible booking experience. Price Range:Get the tickets availability according to your budget and book the best available fares by simply using this feature. Departure Time:This option will enable you to get the list of buses which specifically start/leave at or between particular selected timings. This feature will help you to plan according to your convenient time to travel. Bus Type:When you search, there will be long list of available buses displayed - however with this smart option you can particularly choose to travel on the type of bus you prefer. It can be Luxury, Hi-Tech, Volvo, Semi-Sleeper, Sleeper, etc according to your convenience. Bus Operators:We have noticed that most of our customers prefer to travel on a particular operator service because of better service and all. keeping this convenience of yours in view, we have implemented this option where you can simply click on a particular operator and only those operator's buses are displayed for easy booking experience. Boarding Points: Not sure which buses reach specific boarding points? Just choose this option and you will find a list of boarding points which you can choose as per your convenience and board the booked bus accordingly. Dropping Point:This unique filter helps you to choose only those buses which have specific dropping points. 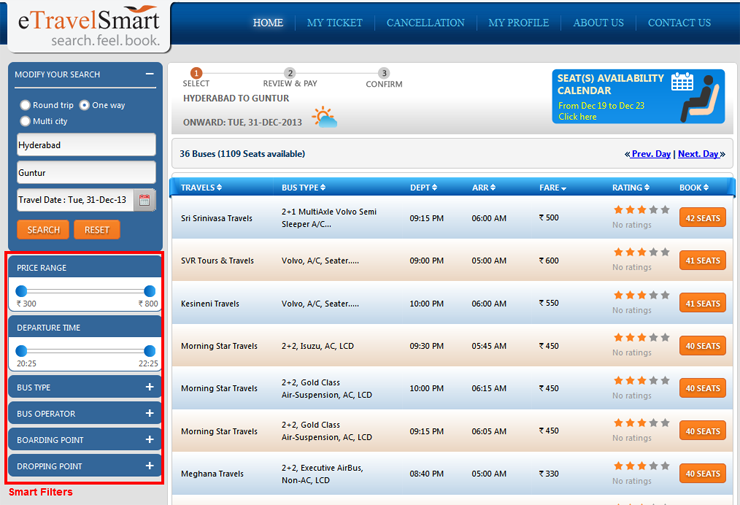 Use eTravelSmart's smart filters to choose your desired bus amount huge list of buses in bus search layout.